After a week of deliberating over 200 applications, our judges have chosen the shortlist of companies for PITCH, our startup pitching competition at RISE. We are happy and honored that we will be among those few startups who get a chance to pitch at Asia’s biggest startup conference. We’ve been at RISE last year and it was huge! Apparently, this year RISE will occupy at least twice the space for twice the number of attendees — that makes at least 10,000 startup folks all in Hong Kong! Now it’s time for me to get my pitch straight. I will have a total of 7 minutes on stage: 4 minutes to pitch and 3 minutes Q&A. That’s a bit odd to me, because I usually have either 3 minute, 5 minute or 10 minute pitches. Those ones I can run through more or less smoothly now. However, this now is the best opportunity for me to revise my pitch or better said, bring it up to date. In large parts, my pitch has been the same over the past year. Some members of the audiences I have pitched to, I have seen listening to me 5 times already. Presumably, it has gotten a bit boring for them to listen to me. While I won’t doing any major changes, I will definitely update some content and show some of the new angles we’re looking at, now. Some new traction numbers will be in the pitch as well as new accomplishments, milestones and projections. Stay tuned and I hope you’ll be at RISE this year! 121 Tech Investment Hong Kong is designed to connect tech companies from around the world with Hong Kong’s tech investment and finance community. First off, it was great to see Kevin from Aria Ventures speaking in the panel about “Institutional money and tech: Investor appetite for the sector”. The moderator was persistent kept asking everyone about which companies they invested in. So in the end, Swapit got a great shout-out. I got quite a number of people who knew me, coming over, talking to me and congratulated me for that. Oddly enough, I didn’t have anything to with that, but it definitely got quite some conversations going. The whole event had a quite intimate setting and therefore, it was easy to get to talk a good number of people. Some potential investors were among them, but also other fellow startup founders as well as members of the startup industry. We weren’t one of the officially exhibiting startups and therefore, we didn’t get these scheduled 1-on-1 meetings. When you look at the kind of startups that exhibited there, it was very clear that they are at a much later stage than Swapit. So perhaps this might be something we could go to next year? I saw an investor attendee at the event who was carrying around a green umbrella. I immediately recognized the share and color and looked more closely. Believe it or not, that was one of our very own Swapit umbrellas. Have a look at the photos we took for our OnePlus X give away. The Swapit umbrella snuck itself into those. Of course, I was curious to find out where he got that umbrella from. So we talked for a little while and as it turns out, that person’s wife is an avid user of Swapit. She is so active, that she even bought something from one of our team. We have this unwritten rule, that we give everyone we deal with on Swapit, two Swapit umbrellas. One for themselves and another (we hope) for a friend of theirs. It’s great to see the effect of that policy in real-life in such a surprising way. Our Swapit umbrellas are unique pieces of art. We only made 200 of those. So if you have one, treat it with care. It’s a collector’s edition! The Swapit has been invited to join the ASIA BEAT 2016 conference in Xiamen, which takes place March 17th – 19th in Xiamen. We will have our own booth, we’ll also pitch at the Asia Beat Startup Pitch and we’ll be happy to present the latest Swapit innovation to the crowd. Last week I have been in Dublin at the Web Summit. It’s the largest conference for startups in the world! What started 4 years ago with just 400 attendees, was expected to draw 30,000 attendees in this year. Actually, it ended up being 42,000 attendees who flocked into Dublin – a city with a population of 700,000. Unlike at RISE this year, we didn’t have a booth for Swapit because I didn’t actually plan to attend. I guess, if we had applied for a startup booth at the Web Summit, we would probably have been accepted as well. It’s actually quite a selection process startups have to go through, in order to get a booth there. So this year, I was invited by Hong Kong’s main startup advocate Casey Lau. Casey co-founded StartupsHK, is our point of contact at the SoftLayer Catalyst Program and was the co-host of RISE 2015 and will also be the co-host of RISE 2016! In the end a great group of people from Hong Kong made their way to Dublin as the “Web Summit StartupsHK Entourage”. This included some Hong Kong’s startup industry leaders like Simon from NEST and Yat from Outblaze who were both also speakers, Bay from Brinc.io, Gabriel from Jaarvis, Gene from Citymapper, Nina from NBD Ventures, Mike from Gormei, Kay from Easi-Way, Julien and Mathis from Ambi Climate, Farook from Mark Masons Investments, Ovey from EventXtra, Joey from Shortlist, and many more – including our lovely friends from InvestHK. It was my first time at Web Summit and like many others, I was overwhelmed by the sheer amount of startups, companies, investors, speakers and information that was all around you. The Web Summit took place at the Royal Dublin Society (RDS) which is just massive. Because there were so many people and startups attending, the whole summit had to be split into two locations on the RDS premises which were a fluffy 10 minute walk apart – with a horse race track, staples and sports arena in between. Just to give you a rough idea about the size. The Centre Stage alone had seats for 6,000 people. Like usual, the Web Summit started before it actually started. The night before day 1, our great friends at SoftLayer organized a dinner for all SoftLayer Catalyst Startups who were attending Web Summit. Being jet-lagged and roughly 40 hours awake (it’s not easy to get to Dublin!) I made it there on time. Coming from Hong Kong, I didn’t expect much from the dinner as those dinners are here usually a boring event where most people just go for the free food there. Anyway, I was very positively surprise by the SoftLayer Catalyst folks. Besides the fact that the food and drinks were outstanding (note: red wine hits you quickly when you’re in sleep deprivation mode), I met very interesting people. Next to me on the table was Andy from 500 Startups London, in front of me was a guy running an accelerator in Dublin, left to me a great startup from the UK. It was interesting to see how other startups use the SoftLayer infrastructure, but it was even better for me to get to talk to many industry / accelerator / investor folks from Europe. The actual Web Summit was running for 3 days and divided into 21 sub-summits. So it was easy to follow the summit(s) which you’re interested in. There are a lot of great startups out there and many are working on very interesting businesses. For example, my old friends from the BlackBerry days, Krishna and Teemu, were there for Juno – a mobile payments company. Startup pitch competitions were also taking place over all three days. Besides all the exhibiting and pitching startups, there were constantly talks, interviews and panels at many stages across the venue. For instance, it was great to get some insights from Michael Dell on his journey traveled and ahead – especially with the $67bln takeover of EMC. Or startup unicorn founders like John Collison from Stripe, the co-founder of Slack and many others. Let’s take Slack for example. While I have been using it with the StartupsHK folks to communicate efficiently, as a result of Slack’s co-founder’s talk, we are now using it internally to communicate about the development and design work on Swapit. It has always reminded me a bit of IRC which it was probably based upon. Of course, we also needed to have a bit of fun at the Web Summit. There was a proper Lion Dance scheduled to take place at the RISE 2016 booth, but we couldn’t wait any longer and practiced it ourselves first. Still needs some more practice, though. The RISE 2016 booth also gave us the opportunity to promote Hong Kong as a startup hub to the (pre-dominantly European) world. Of course, I was happy to help promoting Hong Kong to everyone who wanted to know more about it. There seems to be a lot of interest out there. Many startups know that Asia is a great place to be for a startup and RISE having set up shop in Hong Kong (and not in Singapore), added fuel to our thriving eco-system here. So all in all, it was a great trip. I could make some great new connections, meet and talk to peers whom I am connected with for years. Often, we just don’t get together because everyone is busy with their own businesses. Web Summit is a great place where the travel routes of many people in the industry intersect. Only at these kinds of events, you run into people like Dave McClure (founding partner of 500 Startups) at night during the Pub Crawl Summit. From a Swapit perspective, we are currently in our seed raising mode. Some of the investors I talked to, are a bit “later stage”, which is fine. It is always good to say “Hi” first, let them know about our product and our roadmap, and when we enter their level of investment size, we already have our credentials established. As for RISE 2016, we will absolutely apply to exhibit with Swapit in the START level of Startups next year. We are absolutely confident, we will get in there and be able to show our track record and traction gained over the course of the year. So far, stay tuned, and keep an eye out for the next Swapit update. It’s coming your way soon! As mentioned before, swapit was present at TechInAsia with its very own booth. I did not expect much from the conference. As swapit is currently available in Hong Kong only, we could not really reach out to new users because the TechInAsia conference took place in Singapore. We also couldn’t spend much on this conference (in fact, we don’t actually have any marketing budget for this), but to our advantage, we received the booth for free at the conference. It’s probably just a conference marketing perk to encourage startups to actually exhibit there, but it sold me. So I went over to Singapore by myself, the swapit pull up banner in hand and set up shop there. In terms of feedback, Singapore was the best place to go. Carousell, probably the most prominent competitor in the region has its home base in Singapore. 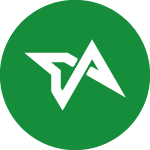 (I will soon write a blog post about our competitors – watch out for it!) So many folks in Singapore were familiar with the concept of buy & sell apps for pre-loved items, which means they got me right away when I said: “Swapit is like Carousell, but better.” (read The idea behind swapit) Therefore, many people could quickly get the advantages swapit offers and whether or not they make sense to them. Hence, we received a lot of great feedback – very positive feedback directly on our approach, but also a lot of suggestions and different takes on the buy and sell market for second hand items. All that feedback will find its way into our next betas! So our goal of getting valuable first-hand feedback was achieved within a few hours of exhibiting. In terms of talking to investors, I did not expect much actually. Being based in Hong Kong means you are not expecting much there — but that’s a different story. In fact, I was very surprised that there was a good crowd of investors present in Singapore, but not necessarily based in Singapore. They were very keen on talking numbers, vision, mission and market penetration. Obviously, I was happy to tell our story. I came prepared with a more refined pitch deck (thanks to our pitches, pitches, pitches, pitches, pitches before) and an updated executive summary to move things forward. We have now advanced to the next state. Once we close our current funding round, we will announce it here on our blog. 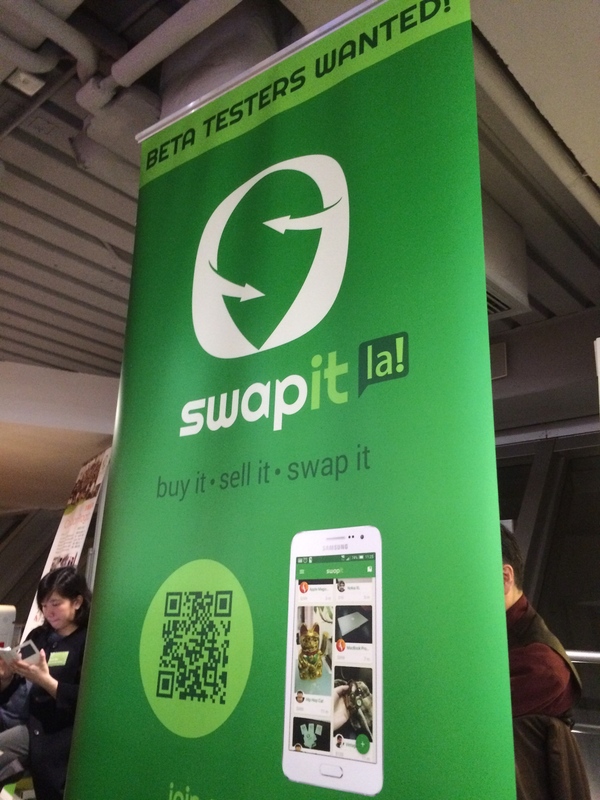 If you’re interested to know more, feel free to reach out to me directly at patrick@swapit.la. So again, our goal of getting to talk to investors was more than satisfied. In short: The trip to TechInAsia Singapore was well worth it! Here are some impressions from before and a bit during the conference. There is no photo with myself on it. As soon as the doors opened, I was completely occupied for the whole day and didn’t even have enough time to grab a coffee in between or check emails. So there are no photos with actual people on our booth, but I guess you get the idea. P.S. : Congrats to Hong Kong’s Easyship who won the pitch competition. We did not participate in that, though. The swapit team has set up shop at the TechInAsia Conference which is being held at the SUNTEC Convention Centre from May 6th to 7th, 2015. We are happy to give all of you a demo of our app, tell you a bit more about our philosophy and why we are building swapit in the buzzling city of Hong Kong. Just look out for the guys in green – sporting our great swapit T-shirts – and our great swapit banner that has become famous already! We love to talk to each of you and we can guarantee everyone who to talks to us, a spot in our private invite-only beta of swapit.